Meguiar's Detailing Clay quickly and safely removes bonded surface contaminants such as overspray, industrial fallout, fresh water sport, tar, rail dust and tree sap mist. Equally effective on paint, glass, metal and plastic. Simply lubricate surface with Meguiar's M34 Final Inspection, or diluted Meguiar's Last Touch D155 and gently run surface until mirror smooth. I have used many clays. This clay works great and is priced reasonably. Consistency of the clay is medium firm. 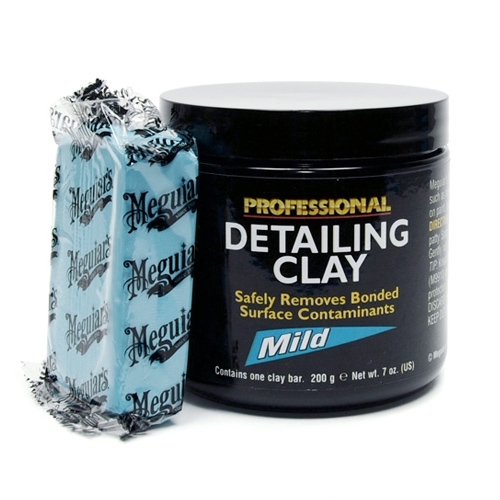 The Meguiar's clay that you buy in retail stores has a much higher density making them much more difficult to knead. Overall this product works great and i would highly recommend it. Detailers clay has been all the buzz of late, so I had to give it a try. Although I try and keep my car clean, ultimately it gets beaten with road tar, tree sap and oxidation. Even after washing it, it still didn't feel smooth. After using this clay, its amazing how it restores the finish to showroom condition where it easily removes any contaminant stuck on your paint. Follow up with a coat or 2 of wax and you'll be amazed.